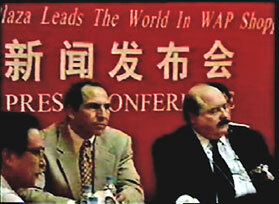 Global Agora China Inc. ("GAC"), a Hong Kong corporation, has developed and deployed (Opening Ceremonies July 28, 2001) a proprietary "wireless shopping" technology platform ("Platform"). This platform currently enables China for wireless shopping, which allows consumers to use wireless Internet (WAP) phones to browse, pay, and take delivery of virtually everything available to Chinese retail consumers. The company's fulfillment partner, Wuhan Department Store Group, is the most profitable publicly-traded retail chain in China. It is under the aegis of the National Trade Union of China (the"NTU"), a retail industry group of 20 state-controlled department store chains with revenues in excess of RMB 40 billion ($5 billion US). Users can presently order from over 40,000 items of merchandise using Internet (WAP) enabled phones.